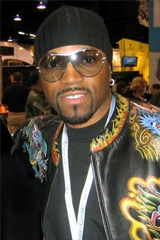 It has been over a quarter century since Teddy Riley walked into the music industry. And he still has his wish list ready when you question his aspirations, proving that his illustrious track record still has room for improvement. Granted, there is only one name on that list and that belongs to the artist he looks to as the last bonafide superstar to emerge. But it proves his authenticity as the acclaimed producer he is. Similar to D-Dot – who we covered last month in Producers Corner [click to read] – this Harlem native has nurtured various producers who have obviously learned from the best to become the best. The Neptunes and Rodney Jerkins are from the Riley School of Development and well we all know what they have achieved. Talking to HipHopDX, the Blackstreet front man gets into his financial affairs, his plans to travel the roads with his former band mates and gives us an insight to just what is going on with QDT. HipHopDX: You were a judge on American Idol this year; how was that whole experience? Teddy Riley: Man, that experience was so incredible. It just gave me and enlightened me to get back in the business and that is what I am doing. DX: Do you follow these shows where they focus on finding the stars of tomorrow?